Former commanding general of the American forces in Europe and supreme commander of the Allied Expeditionary Force during World War II, Dwight D. Eisenhower was Columbia University’s thirteenth president. Eisenhower was absent from the University for long stretches of time during his tenure, most significantly in 1950, when he took a leave of absence to become the first supreme commander of the North Atlantic Treaty Organization (NATO). Even though these absences, combined with his official duties, made impossible his expressed wish for closer contact with students, he manage to regularly attend Columbia football games at Baker Field. Eisenhower’s presidency saw a number of developments at the University, including the founding of the Columbia Center for Oral History (1948), as well as the Lamont Geological Observatory (1949), later known as the Lamont-Doherty Earth Observatory. 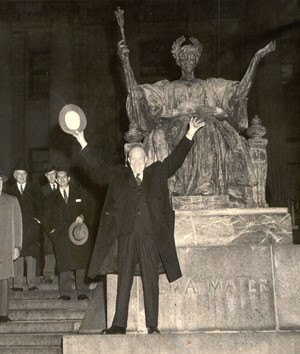 Following his election as the 34th president of the United States, Eisenhower resigned as Columbia University president effective January 1953. Read more about Dwight D. Eisenhower in Columbians Ahead of Their Time.